The NHL Entry draft is in the books, with 211 young men realizing their dreams of being selected in by an NHL team. Yesterday saw a bunch of trades, that saw swapping of picks and players on the move. 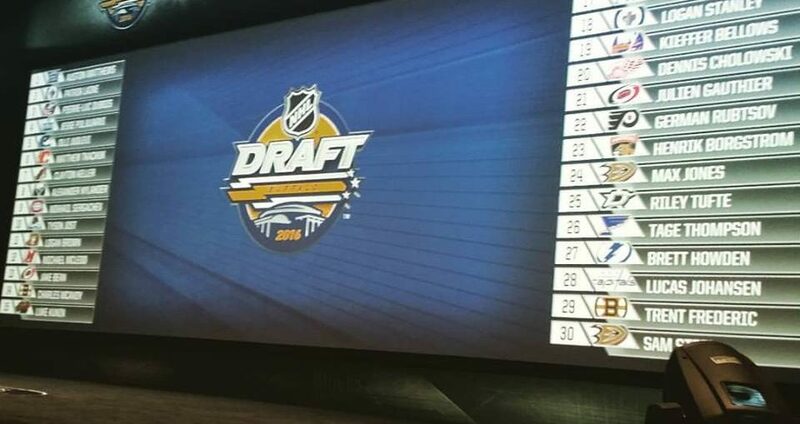 Day two saw some similar action with the Florida Panther continuing to redo the defence by sending Dmitry Kulikov and 33rd overall to the Buffalo Sabres for Mark Pysyk, 38th overall and a 3rd round pick. The Dallas Stars sent former first round pick goaltender Jack Campbell to the Los Angeles Kings for defensive prospect Nick Ebert. The last deal that included a player during the draft saw the Penguins send oft-injured forward Beau Bennett to the New Jersey Devils for a third round pick. The Tampa Bay Lightning shipped out defensive prospect Anthony DeAngelo (above) to the Arizona Coyotes for the 37th overall pick, who they used to select Czech born defenceman Libor Hijek. Those weren’t the last moves of the day, as the Columbus Blue Jackets shipped Kerby Rychel to the Toronto Maple Leafs for defenceman Scott Harrington and the Colorado Avalanche sent defenceman Nick Holden to the New York Rangers after the final draft selection. Although those are the things that will grab the headlines, an overriding theme of the draft was teams taking overage players that were skipped over in previous drafts. Time will tell if it’s because there was still so much talent left from last year or more of a reflection of this years class. The extreme to this was the Florida Panthers taking a player who was born in 1995. After spending the last few weeks looking at the future, teams will now turn their attention to the free agent market and try and make their teams better in the now. Players like Steven Stamkos, Milan Lucic, Kyle Okposo and Loui Eriksson are the big names out there for teams looking to adding scoring. There are some interesting names on defence available, but with Alex Goligoski and Keith Yandle signing contracts in the last week, it’s clear that the talent is available in the forwards ranks. There is also the possibility that teams have laid the groundwork for trades in the coming weeks. So although the big event is now over, there is still a chance that things may happen in the hockey world in the coming days.